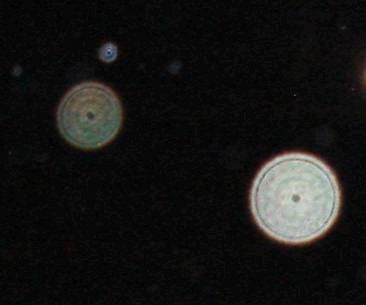 This thread is intended to give a Christian biblical perspective on spiritual orbs. I will proceed to demonstrate how these spiritual orbs are supernatural and divine. The photographs and the video that I will be presenting are of the Holy Spirit and some of His works. These photographs and videos have been a mystery to mankind for decades. The Holy Spirit is highly misunderstood in the world. Many have seen Him, but few have recognized Him. He is erroneously known as paranormal orbs, spirit orbs, angel orbs, and ghost orbs. 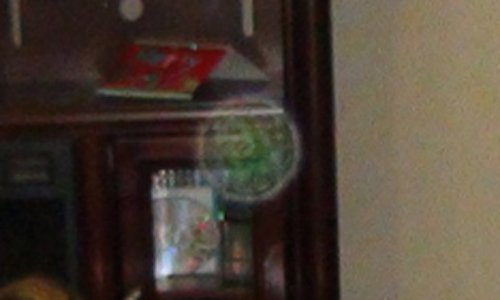 Some people who have not seen orbs with their naked eyes believe them to be photographic anomalies. To understand the Holy Spirit, we must consult scripture. I will be using both the Old and New Testaments of the Holy Bible. This is a photograph of the Holy Spirit descending like a dove as He did during the baptism of Jesus. Here is a photograph of the Holy Spirit motionless. 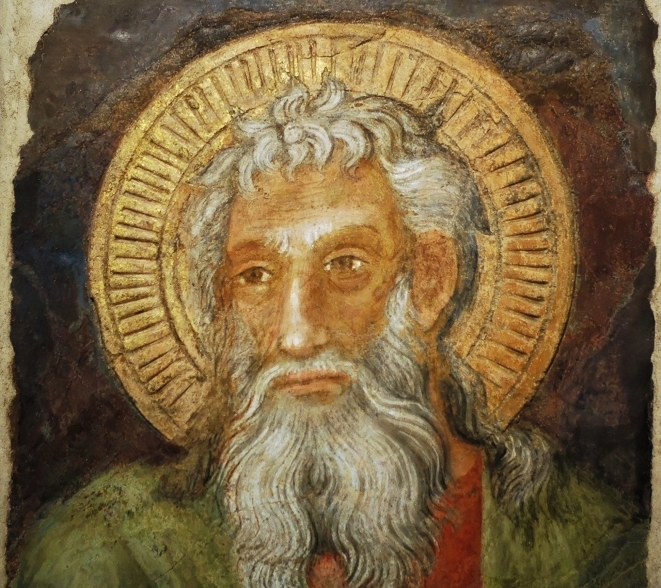 Below is a painting of Saint Andrew with the Holy Spirit upon Him. The Halo is found in scripture as the Holy Spirit alighting and remaining upon Jesus. The Spirit of God and the Spirit are both one and the same Holy Spirit. Mathew 3:16. When He had been baptized, Jesus came up immediately from the water, and behold, the heavens were opened to Him, and He saw the Spirit of God descending like a dove and alighting upon Him. John 1:32. John testified saying, "I have seen the Spirit descending as a dove out of heaven, and He remained upon Him." The center photograph above is of the Holy Spirit in His spirit body form. Luke 3:22. And the Holy Spirit descended in bodily form like a dove upon Him, and a voice came from heaven which said, "You are My beloved Son; in You I am well pleased." The Holy Spirit alighting and remaining upon Jesus appeared as a Halo. The Spirit of truth is another title for the Holy Spirit. John 14:17. the Spirit of truth, whom the world cannot receive, because it neither sees Him nor knows Him. NKJV Scholastic Commentary: Neither sees Him nor knows Him does not mean merely that the world is not able to visually identify the Holy Spirit because He is spirit. Something more is meant: The Spirit of God is active in the world, but His acts go unnoticed by the world (1 Cor. 2:14.). Not only is the world in general unable to visually identify the Holy Spirit, His acts go unnoticed as well. The Holy Spirit appears to be revealing to us through the Halo that He is the breath of life given to all mankind in the very beginning by God. This is not to be confused with the life Christ gives us through the Spirit of truth. Genesis 2:7. And the LORD God formed man of the dust of the ground, and breathed into his nostrils the breath of life; and man became a living being. The term "Spirit" translates the Hebrew word ruah which in it's primary sense, means breath, air, wind. God gave man life through His Holy Spirit. I believe that the breath of life went into man's nostrils and is located over and throughout the brain giving us life. Hence, the Halo is over the head, representing the Holy Spirit giving us life. And without the breathe of life, the brain would not function and we would have no life in this world. The breath of life is connected to our spirits by the silver cord. When the silver cord is loosed, we are cut off from the breath of life, the brain dies, we become disconnected from our bodies, and are no longer part of this physical world. Ecclesiastes 12:6-7. Remember your Creator before the silver cord is loosed, Or the golden bowl is broken, Or the pitcher shattered at the fountain, Or the wheel broken at the well. Then the dust will return to the earth as it was, And the spirit will return to God who gave it. I believe that the Halo would be the Holy Spirit's rightful place in revealing to us that He is the breath of life given to all mankind in the very beginning by God. And thus the Halo does not have to be limited to Christianity. The chariots of God are the living works of the Holy Spirit. Artist rendition of Ezekiel's Vision of God (based on scripture). What you are looking at above appearing before Ezekiel, a beloved prophet of the Holy Bible, is Father God on His throne, a firmament, Cherubim (living creatures), and what Ezekiel describes as "a wheel in the middle of a wheel" - this is an orbital description of a great living chariot of God. Ezekiel 1:15-21. Now as I look at the living creatures, behold, a wheel was on the earth beside each living creature with it's four faces. The appearance of the wheels and their workings was like the color of beryl, and all four had the same likeness. The appearance of their workings was, as it were, a wheel in the middle of a wheel. When they moved, they went toward any one of four directions; they did not turn aside when they went. As for the rims, they were so high they were awesome, and their rims were full of eyes, all around the four of them. When the living creatures went, the wheels went beside them; and when the living creatures were lifted up from the earth, the wheels were lifted up. Wherever the spirit wanted to go, they went, because there the spirit went, and the wheels were lifted together with them, for the spirit of the living creatures was in the wheels. When those went, these went, when those stood, these stood; and when those were lifted up from the earth, the wheels were lifted up together with them, for the spirit of the living creatures was in the wheels. Below is a photograph of a spirit in one of the many small chariots of God. Ezekiel 1:21. "for the spirit of the living creatures was in the wheels." ..................... "for the spirit of the living creature is in the orb." Ezekiel 1:19. "when the living creatures were lifted up from the earth, the wheels were lifted up." 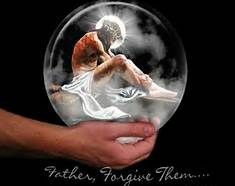 ......................"when the living creature was lifted up from earth, the orb was lifted up." Here is a short youtube video of a spirit flying in a small chariot (orb). Both good and evil spirits travel in these chariots (orbs). Psalm 68:17. The chariots of God are twenty thousands, Even thousands of thousands. The Lord is among them as in Sinai, in the Holy Place. 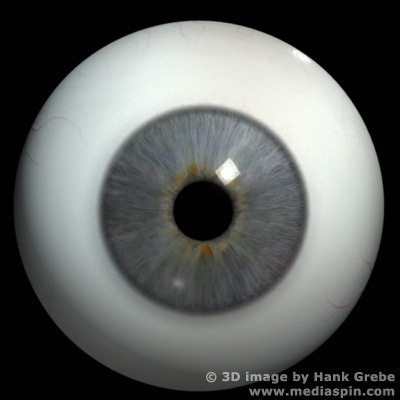 Please notice the pupil in the human eye. The center dot in the photograph below is the pupil of the Spirit of truth. The photo above is of the Spirit of truth looking directly at the camera man and bearing witness to him taking the photograph. 1 John 5:6. And it is the Spirit who bears witness, because the Spirit is truth. The Holy Spirit also bears witness to our consciousness. Romans 9:1. I tell the truth in Christ, I am not lying. my conscience also bearing me witness in the Holy Spirit. It is through the Spirit that the Father and Jesus hear our prayers. Romans 8:26. Likewise the Spirit also helps in our weaknesses. For we do not know what we should pray for as we ought, but the Spirit Himself makes intercession for us with groaning's which cannot be uttered. God demonstrates His presence here on earth through the eyes of the Lord. 2 Chronicles 16:9. For the eyes of the Lord run to and fro throughout the whole earth, to show Himself strong on behalf of those whose heart is loyal to Him. Psalm 34:15. The eyes of the LORD are on the righteous, And His ears are open to their cry. The Spirit of truth glorifies Christ by bearing witness that we belong to Christ and declaring this to the Apostles who sit on the thrones of judgment so that we are not judged and may go onto the Father. John 16:13. However, when He, the Spirit of truth, has come, He will guide you into all truth; for He will not speak on His own authority, but whatever He hears He will speak, and He will tell you things to come. He will glorify Me, for He will take of Mine and declare it to you. All things that the Father has are Mine. Therefore I said He will take of Mine and declare it to you. This is how Christ builds His kingdom through the Holy Spirit here on earth. Romans 8:16. The Spirit Himself bears witness with our spirit that we are children of God. The Holy Spirit has a living memory and it is absolutely perfect. Imagine the painting below being a painting of the Holy Spirit's memory of a time when Jesus was in His human body and praying to Father God. This memory would literally be a living spirit identical to Jesus at that time with all His thoughts, feelings, personality, and powers. It would be an exact copy of Him at that time. One of the powers that God has brought into the spirit world is the power of teleportation. This is done through the Holy Spirit's memory. A spirit at point A goes into nothingness. And is recreated at point B by the Holy Spirit. This is merely a glimpse at how perfect the Holy Spirit is. It is said that this image miraculously appeared on fabric December 12, 1531. 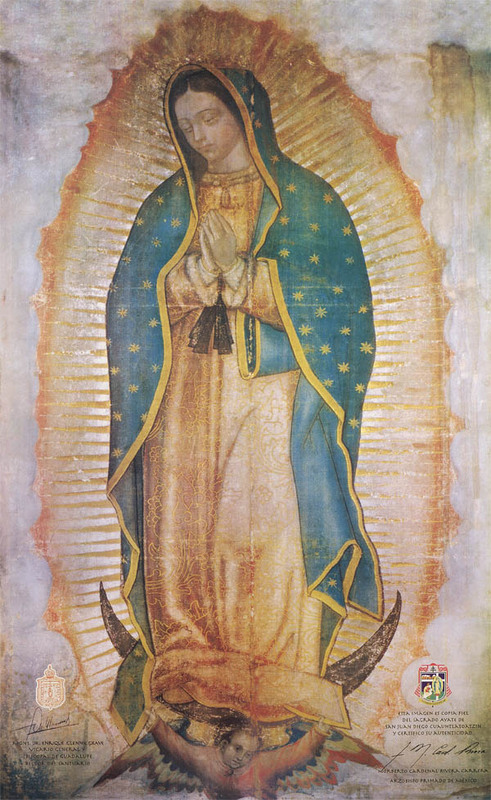 NASA has discovered of Our Lady of Guadalupe to be living. "The space agency NASA (USA) published the results of research made over the icon Our Lady of Guadalupe." "Sensational was the fact that analysis of opthalmologic eye reduction Mary showed pupil at the approach of light and the expansion at it's disposal as it happens with the eyes of the living person." "Also, researchers found that tissue temperature, which depicted an image, meets healthy human body temperature - 36.6 degrees." "When listening to the body Mary stethoscope, the researchers found a significant heart rate of 115 beats per minute, which corresponds to the baby's heartbeat which is in the womb." I believe that God has been inspiring great artists for centuries now. Acrylic painting inspired by God through a dream. By: Child Prodigy Akiane Kramarick entitled, "Pyramid." 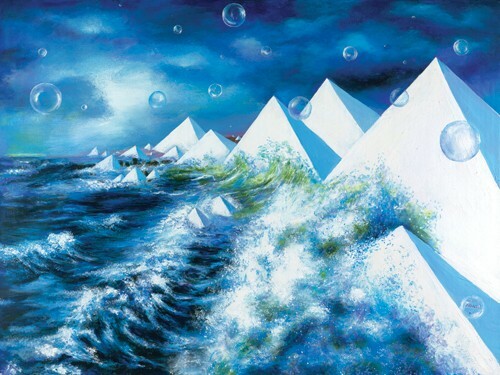 ...In one of my dreams I saw the image of white pyramids beaten by ocean waves and surrounded by live bubbles. Unlike most of my paintings, I had no idea what those symbols meant, but I painted them anyway. It appears that God is inspiring a modern day artistic genius to paint, "live bubbles." 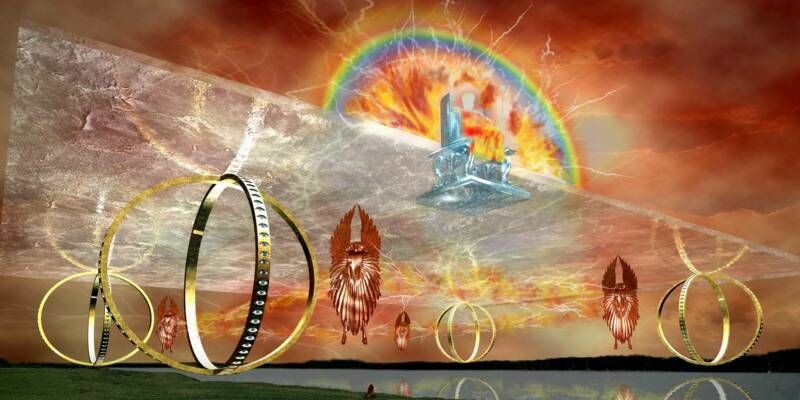 Elijah would have traveled in a spiritual whirlwind (tunnel) on his way to heaven. 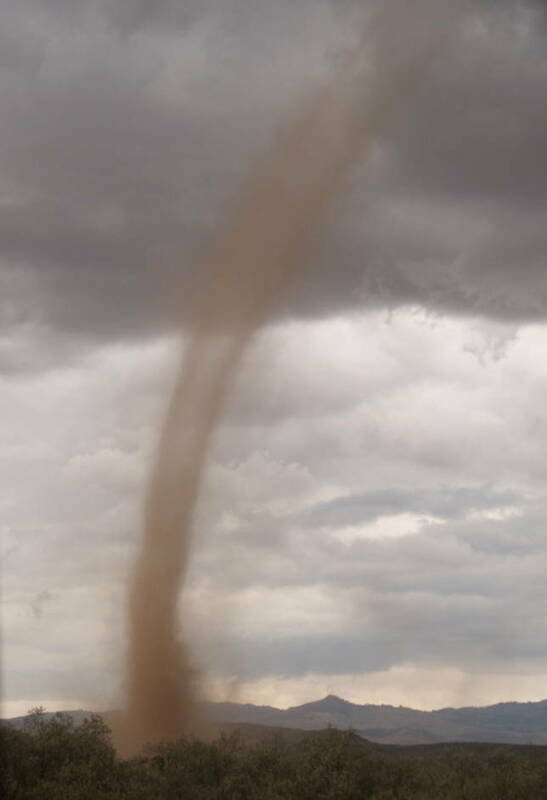 Here is a picture of a physical whirlwind. 2 KINGS 2:11. ...Elijah went up by a whirlwind into heaven.